Prepping The Show With Sean | Miguelito's Little Green Car. We are all connected. 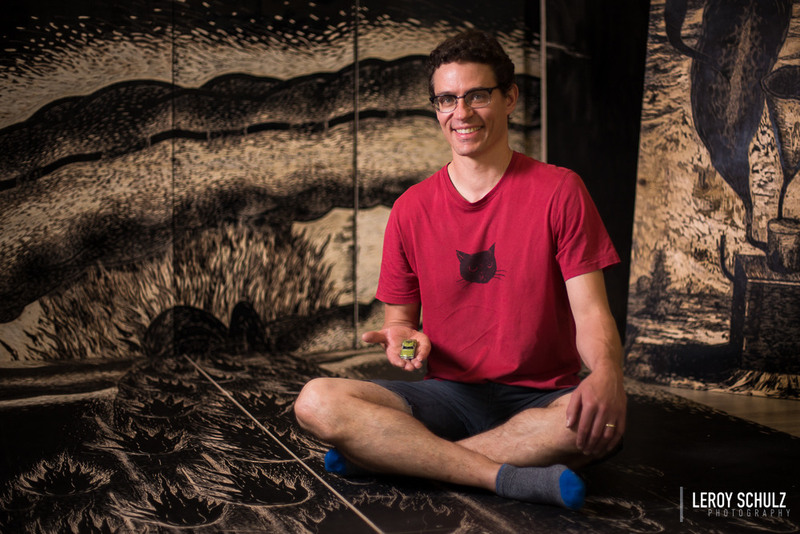 Sean is a Centennial Professor in the Department of Art and Design at the University of Alberta. He has exhibited his prints, drawings and artist’s books extensively throughout Canada, the United States, Europe, and Japan. Recent exhibitions include: The Flood, Art Gallery of Alberta, Edmonton; Firedamp, dc3 Art Projects, Edmonton; The Body in Question(s), UQAM Gallery, Montreal; Perceptions of Promise, Chelsea Art Museum, New York, USA/Glenbow Museum, Calgary, Alberta; The New World, The Centre for Modern and Contemporary Art, Debrecen, Hungary. Over the years Sean has collaborated on a number of creative research projects with other academics and researchers as well as his two brothers. He’s explored themes ranging from stem cells to vaccines to the environment. Visit his website and enjoy two of his pieces below. 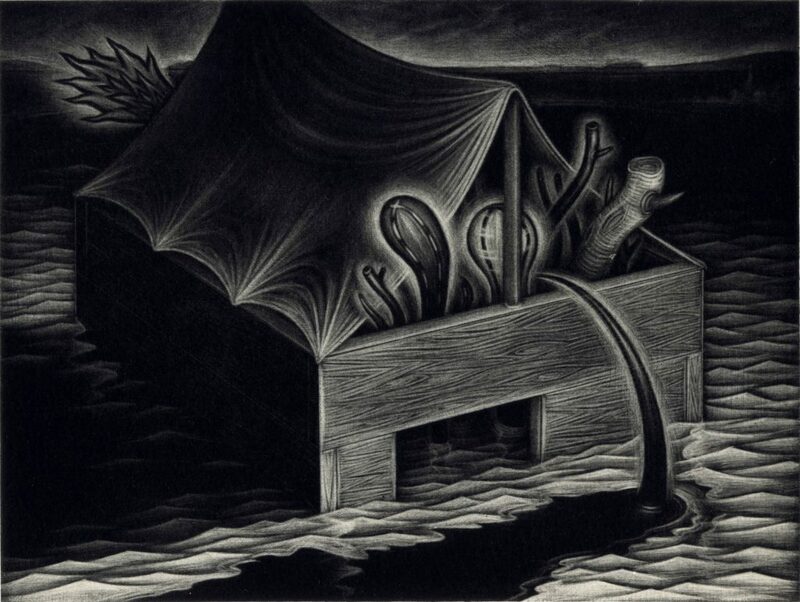 Snake House, mezzotint, chine colle, 6” x 9,” 2015. 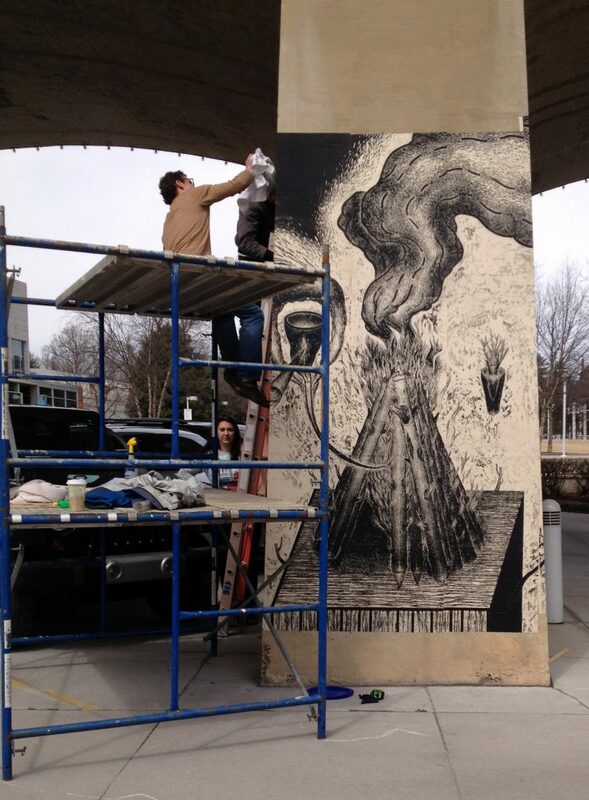 Artist installation temporary public artwork (section of relief print The Flood), hosted by the University of Tennessee, Knoxville, Tennessee, 2015. The basement of his childhood home would flood every spring. Now he has a strange, obsessive fear of leeches. He once almost accidentally killed his oldest brother with a bear flare that he found on a hiking trail. When he played in his older brother’s band they had a gig at the maximum security prison. Once.